You’re just about to arrive home, after a very long day at work. You’re driving around the corner into your street, and your house’s garage door is already in sight. With great relief you press the garage door opener, only to find that its door is stuck as something prevents it from opening. Well, it sounds like you need garage door repair services in Arlington TX, and you know who to call. Veteran company is always at your service, anywhere within the Dallas Fort Worth Metro area. Whenever you’re in need of our garage door repair services, we’ve got you covered. You can call us day or night, during the week or even during the weekend if needed – don’t worry about it – we won’t even charge you with any extra fees. So, if you need us, first give us a call, and worry about the details later (or not at all). Sometimes the thing causing your garage door to stand still in its place and not to open, can be something insignificant, as a box standing in its way, which can be solved by simply removing the box from the garage door’s tracks. But in other cases the problem may be more difficult, such as torn springs or a dead engine, that need to be replaced before allowing the garage door to operate properly. In cases like those or any other garage door malfunction you feel you shouldn’t handle on your own – call for our garage door repair solutions in Arlington TX. Yes! Veteran company doesn’t offer only garage door repair in Arlington TX, but also any other service that will allow your garage door to operate smoothly. Your garage door is missing parts? The tracks are broken? The opener is not working? We’ve got you covered for any type of garage door you may have. We will size the problem up and deliver the best solution for the situation. The door is beyond repair and you wish to replace it? 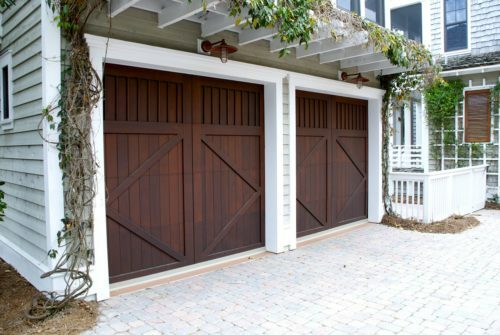 You can explore our garage doors gallery and choose your new design out of our great collection. Call Veteran Garage Door and we will shortly be on our way!